For all 10 days of the fair, you can see world-class entertainment at the Grandstand stage. From motorsports and rodeos to the nation’s top country, christian, and rock acts. This stage has hosted big-time stars and musical legends such as Brooks & Dunn, Brett Young, Alabama, and many more. There’s nothing like finishing your day at the fair with an amazing show! So whether you are looking to sing along to your favorite country hits with your friends, or give one lucky person the gift of entertainment they are sure to remember, you can find the right experience at the Grandstand. Make sure to keep an eye out on our social media for show announcements and meet and greet opportunities! The Grandstand is located at the far east end of the fairgrounds, near Gate 3. See the map below for more information. Seating and handicapped accessible options available for most shows. See you at the Grandstand! In the hub bub of it all is a big giant tent where you can enjoy great live music brought to you by the Indiana 105.5 Fire Up Concert Series. Do not miss these buzz-worthy acts! Past concerts have included Emi Sunshine, Brown & Gray, and more, all free with general admission to the fair. This is also the spot to see a comedy or magic show, learn about exotic animals at the Silly Safari show, or watch a competition like the Cutest Baby Contest and the crowning of our very own Porter County Queen. No matter the weather or the time, there is no shortage of great free shows at this covered stage! Concessions are nearby so grab a corn dog or a funnel cake and be serenaded as you devour. The Park Pavilion is located in the center of the fairgrounds, right off Hefner’s Way and just west of the 4H Animal Barns. See the map below for more information. Be sure to grab your seat and a enjoy the endless entertainment at the Park Place Pavilion. The perfect place to catch an act with the whole family, from bands to, well, some very unique shows. Ever see a pig race? How about a high wire act? Or a magic show that will blow your mind? This is the place to see something you have never seen before, and best of all it’s free with your admission to the fair! Entertainment has included fair favorites like Swifty Swine’s Racing Pigs, Racing Ducks, and Agri-Puppets to new and exciting acts every year, like last year’s Lady Houdini and the Rhinestone Roper shows. While you wait for a show to start, make sure to visit the TSC Barnyard to pet your favorite farm animal and the Large Machinery tent to see antique tractors. The Family Entertainment area is just south of the fairgrounds near Gate 2. Hope to see you there! Right off Hefner’s Way, it’s hard to miss these acts as you enter the fair. Watch talented artisans in action. If you hear the roar of a chain saw it’s probably fair favorite, the Bear Hollow Wood Carvers, who carve elaborate sculptures out of a humble piece of wood. Or see Mobile Glass Studios blow a gorgeous bowl of glass right in front of your eyes. You can even purchase these unique pieces for your own home or a unique gift. The Family Entertainment West area is on the west end of the fairgrounds near the main entrance to the Midway by the Expo Center. See the map below for more information. Some of the shows are interactive, so be ready to roll up your sleeves. Don’t forget to keep your eyes peeled for our roaming acts throughout the fairgrounds all 10 days of fair. 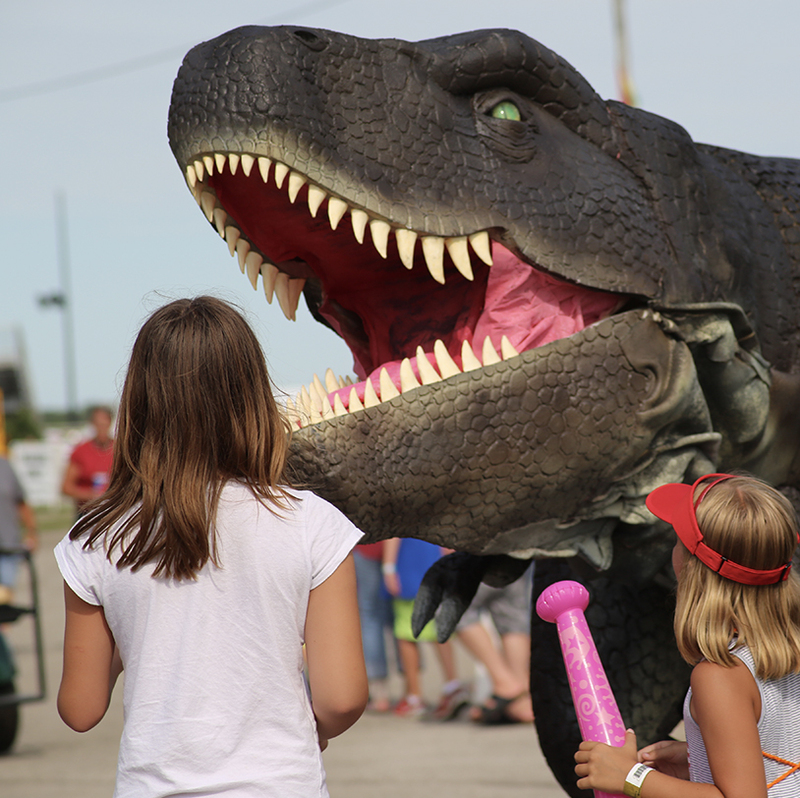 Look out for crazy cowboys, magicians, even life-size dinosaurs and other kooky characters. Just one more way we do our very best to keep you entertained while you are having fun at the fair. * No chairs, strollers, blankets, bottles, or cans are allowed in Pit.